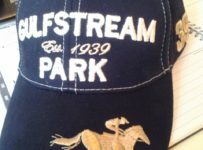 Monday, June 7 — For trainer George Weaver and his budding 3-year-old sprinter Requite, this spring’s goal has been accomplished at Gulfstream Park. 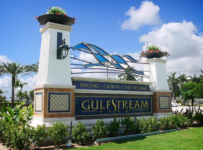 On Sunday, Requite won his second race in two starts at Gulfstream as he turned back a stiff challenge from Grand Bili to capture the $60,000 Big Cypress Handicap at seven furlongs on dirt. Requite was ridden by Eddie Castro and won by a half length in a solid 1:22.91 on a track listed as fast. It was the first stakes win and third victory in four career starts for Requite, a Kentucky-bred son of the growingly successful sire Warrior’s Reward. In the winner’s circle, Weaver said he is ready for the next 2015 step with Requite. This week he will send Requite “up north” for races to be determined, and probably at seven furlongs or less. From late July through early September, Requite will be part of Weaver’s stable at Saratoga Race Course in Saratoga Springs, N.Y.
Requite made his debut last Aug. 9 at Saratoga at 5 ½ furlongs, and won by 3 ½ lengths. Requite’s only loss was last Sept.1 at Saratoga when he finished fourth in the seven-furlong Hopeful (Grade One). Weaver soon discovered an ulcer in one of Requite’s eyes, and that apparently had bothered the colt in the Hopeful. So Weaver and owner Limestone Thoroughbreds decided to give Requite some time to rest and develop. 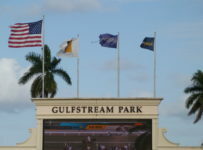 Requite spent the winter training at Palm Beach Downs in Delray Beach. 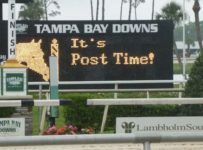 He returned to racing at Gulfstream on May 9 and won a six-furlong allowance in 1:09.92. In the Big Cypress, Requite was the 3-5 favorite in the field of six 3-year-olds. Jacks or Better Farm’s Sing Praises was second choice at 5-2. 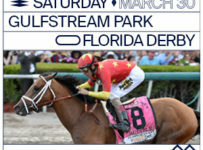 Last year, he won two of the three races in the Florida Sire Stakes Series at Gulfstream. Grupo 7 Racing Stable’s Grand Bili was sent off at 7-2, based on two strong races at Gulfstream where he showed early speed. 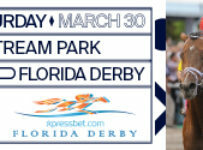 Grand Bili, trained by Gustavo Delgado, began his career on Feb. 1 and won at 5 1/2 furlongs. 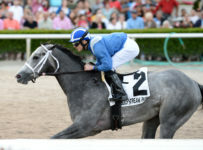 He finished second to the Todd Pletcher-trained Chipit in a seven-furlong Gulfstream allowance on April 8. Grand Bili’s next race was the Chick Lang Stakes on May 16–at six furlongs at Pimlico on the Preakness undercard. He broke slowly, never contended and finished ninth in the 11-horse field. On Sunday, Requite did not win as easily as his odds may have predicated. But Weaver was happy to see his charge respond well to a stretch battle. Requite received a clean, stalking trip as Castro positioned him in third early while front-runners Grand Bili and Sing Praises set the tempo, clocking in at :23.11 seconds for the first quarter and :45.27 seconds for the half. Nearing the 5/16-pole, Castro began to ask Requite for run, and the striking bay responded by immediately closing the open-length gap between him and the leaders. At the top of the stretch Sing Praises, returning from a seven-month layoff, gave way. But Grand Bili had something left in the reserves. Requite collared that rival while three-wide, and it seemed as if he would draw off, but Grand Bili re-rallied on the inside and began to close back in on the lead. The two sophomores dueled to the wire. But once Requite claimed the advantage, he never relinquished it. 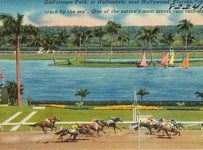 Jacks or Better Farm’s Southern Barbecue finished third, 5 ¾ lengths behind Grand Bili. Bandages, Sing Praises and Big Awesome completed the order of finish. 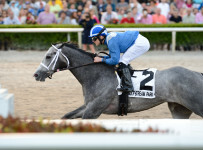 After watching Requite handle a return to stakes competition and a stretch out to seven-furlongs for just the second time in his career, Weaver said that if the owners agree he probably will keep the colt at seven furlongs or shorter. 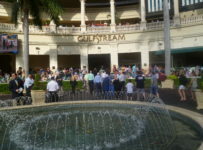 There will be numerous options at Belmont Park this summer. At Saratoga, the six-furlong Amsterdam (Grade 2) will be run on Aug. 1 and the seven-furlong King’s Bishop (Grade 1) will be run on Aug. 29. Grand Bili also appears headed toward a strong summer. 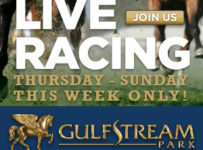 He is an Ontario-bred and thus will not be eligible for Florida-restricted stakes at Gulfstream. 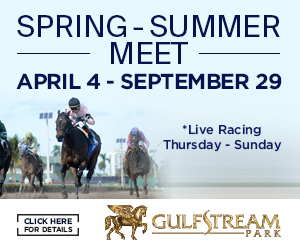 Sing Praises will be eligible for the new three-race series for 3-year-olds in the Florida Sire Stakes. 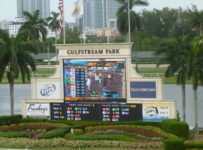 The 2-year-old series and 3-year-old series are restricted to sons and daughters of Florida-registered sires whose owners have nominated them for the series. The series will begin on Aug. 8. 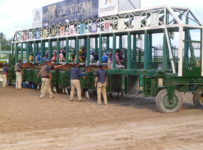 The first race for 3-year-old males is the $150,000 Unbridled at seven furlongs on dirt.